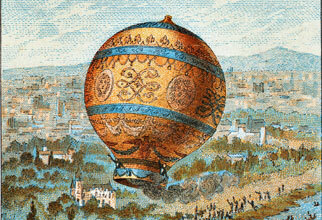 The history of Hot Air Ballooning or Lighter than air Aircraft started in the fall of 1782. On a sunny morning is Annonay France, close to the city of Lyons France, two brothers Joseph and Jacques Montgolfier, inflated a large cloth bag, using the heat from a fire. At the time they were not sure if the smoke inflated the bag or vapors from the fire filled the bag and lifted it but they decided to do a public demonstration of their bag. The brothers built a linen bag 33.5 feet in diameter and on June 5,1783 they inflated their bag in front of spectators using a straw fire. When it was fully inflated, they released it, and it flew to a great height. It remained in the air for 10 minutes before it came back to earth 1.5 miles from the inflation area. In September of that same year the Montgolfier brothers inflated a linen bag in front of the King and Queen of France and a large crowd at Versallies. This time they attached a cage to the bag and placed a Sheep, a Rooster, and a Duck ( the fist air passengers in history ). The balloon rose to a height estimated at 1500 feet, landing 8 minutes later in woods 2 miles in distance. The animals were fine, only the Rooster had a minor injury to its wing, because of a kick from the sheep. Around the same time two other brothers, Ain’e and Cadet Robert along with J.A.C. Charles were experimenting with hydrogen filled balloons convinced it had a better lifting power. They constructed a silk balloon 13 feet in diameter and released it, they estimated it rose 3,000 feet. Barely a month after the flight of the animals at Versallies, Jean Francois Piulatre de Rozier became the first human to fly. October 15,1783 he made the first of assent in a tethered balloon. He kept the air heated by suspending a fire below the balloon. On November 21,1783 he and a friend, the Marquis d’Arlandes, untethered the balloon and flew to a height estimated at 3,000 feet. They flew for 25 minutes and returned to earth 5 miles from their starting point. Ten day’s later J.A.C Charles and one of the Robert brothers flew in a hydrogen gas balloon for 2 hours and 27 miles. Balloon fever had hit and was not restricted to France. Balloon fever spread to all European countries, England and Italy were at the top in the number of people experimenting with all types of Balloons. Many of these balloons had attachments to try and help control the balloons, oars, wings, parachutes and propelliers. None of these proved to be effective. Following these early flights, scientist and adventurer’s have tried to use balloons to collect data at altitudes which until then had been unattainable to human beings. Military use of the balloon started early. The military use was as a platform to view the country side. The balloon didn’t work out that well but it did tend to scare the enemy. The Prussians used balloons against the French to little use. The Americans used balloons in the civil war (1861-1865) and the Spanish-American war (1898). The British used the balloon for aerial photography, Photographing large areas that were under surveillance. World War I saw a large use of balloons the shape of the balloon changed, from the classic sphere shape to an elongated tube with tail fixtures. The balloons were tethered and used as observation posts and later steel cables were hung from them, forcing airplanes to fly above them. This caused bombs launched from aircraft at this time very little accuracy. In World War II these types of balloons were used in the defense of London during the early war years. Today’s aircraft has outpaced the balloon as a military tool. The only scientific ongoing use is weather balloons. These small gas balloons are released at various sites and record weather data. Commercial use of balloons and other LTA aircraft are mainly for advertising. The most famous is the Good Year Blimps fleet, and the special shape balloons that grace the skies. By far the biggest application for balloons today is the recreational or sport use of hot air balloons. One man responsible for the rebirth of hot air ballooning is Ed Yost. Yost worked for General Mills. General mills had technical experience making cellophane food wrappers. This led to a military contract to construct a giant polyethylene balloon for stratospheric research. During the development of this balloon they develpoed smaller training balloons that could be inflated cheaply with hot air. Yost left General Mills and started Raven Industries at Sioux Falls, South Dakota. Raven continued government work on laminated mylar / nylon balloons. In 1955 Yost built a 39 foot diameter polyethylene balloon in the back yard. He designed a multiple burner propane heater that inflated the balloon. In 1960 Yost completed the first successful modern day hot air balloon. It was 40 feet in diameter, inflated to 30,000 cubic feet of hot air, it was made of mylar / nylon laminate and had a lifting power of 450 pounds. Yost ascended to c9,300 feet and came down 3 hours and 15 minutes later. Raven Industries is still one of the largest balloon manufactures in the world. Don Piccard, who started flying in the U.S. Navy at Lakehurst, New Jersey in 1933. After the war he modified a Japanese war balloon, and developed a system of side inflation from hydrogen bottles still in use today. He added an aluminum basket and a drag rope, and on February 16, 1947, made the first ascension in the United States, from the Minneapolis, MN. Parade grounds. Piccard met Gilmore T. Schjeldahl, a veteran balloon maker from Northfield, MN. They worked on balloon research for 4 years. In 1954 Piccard formed the Balloon Club of America. It eventually merged with the Wingfoot Lighter than air Club of Akron, to become the Balloon Federation of America. Today the Balloon Federation of America is sanctioned by the National Aeronautic Association and the Federation Aeronautique Internationale, as the official representative for sport ballooning in America.